More Famous People Who Guest Starred on STAR TREK | Warped Factor - Words in the Key of Geek. There are so many we had to start a second page of famous people who guest starred on Star Trek. Best known as a member of 80s all girl group The Go-Go's, Wiedlin portrayed Trillya in Star Trek IV: The Voyage Home. 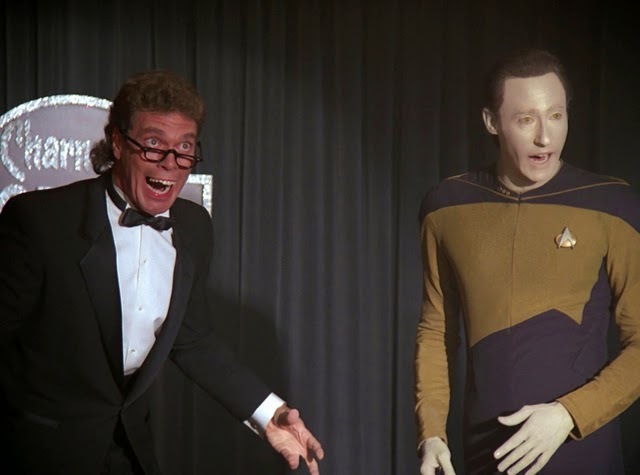 Joe Piscopo played a holographic comedian trying to teach Data about comedy in the Star Trek: TNG episode The Outrageous Okona. Christopher Plummer played Chang in Star Trek VI: The Undiscovered Country. Max Headroom himself, Matt Frewer played Berlinghoff Rasmussen in the 1991 Star Trek:TNG episode A Matter of Time. As rightly pointed out in the comments below, how could we not include Star Trek: TAS? 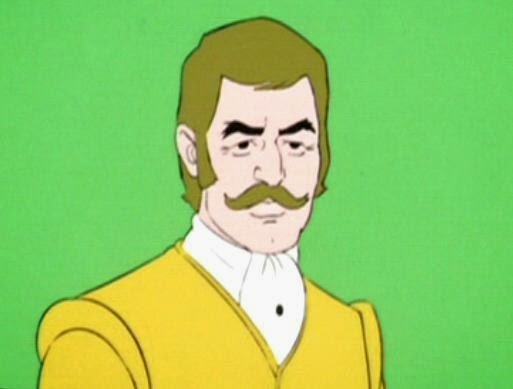 So to correct that slightly we have the animated character of Carter Winston who in the episode The Survivor was voiced by Mary Tyler Moore Show stalwart Ted Knight. 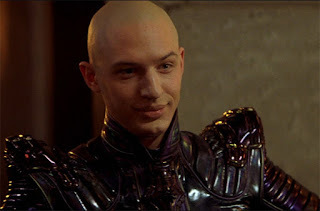 Yep, that's a young bald Tom Hardy as Shinzon in Star Trek: Nemesis. He was also seen in the movie as Jean-Luc Picard in a still photograph during that character's tenure at Starfleet Academy. 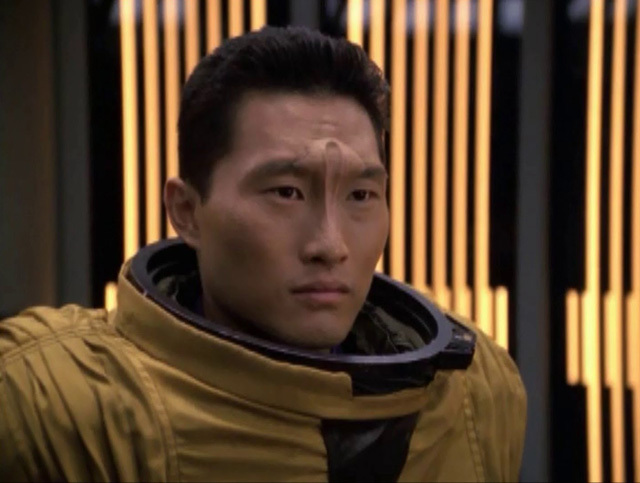 Another Lost alumni, Daniel Dae Kim played Corporal Chang in the Star Trek: Enterprise episodes, The Xindi, Extinction and Hatchery, as well as playing Astronaut Gotana-Retz in the Voyager episode Blink Of An Eye. Riddle me this. Who is that half white face, half black face character above? Why it's none other than Bele as seen in the 1969 Original Series episode Let That Be Your Last Battlefield. 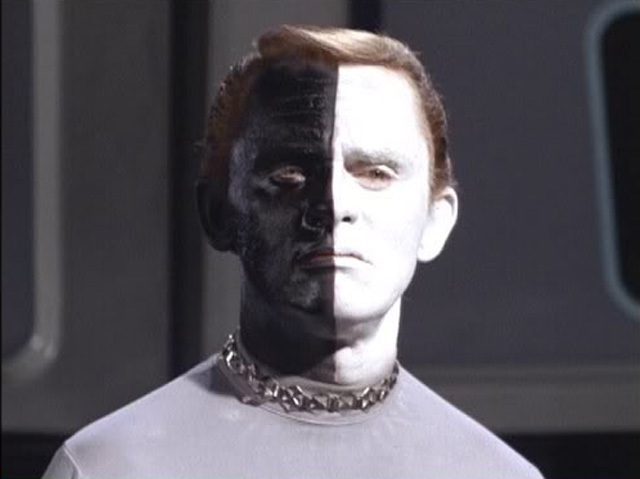 Bele was of course played by Frank Gorshin, who also portrayed The Riddler in the 1960s Batman series. Hellboy Ron Perlman played Reman Videroy in Star Trek: Nemesis. David Warner has played three different roles in Star Trek. He first appeared as Ambassador St. John Talbot in Star Trek V: The Final Frontier in 1989. In 1991 he played Klingon chancellor Gorkon in Star Trek VI: The Undiscovered Country. 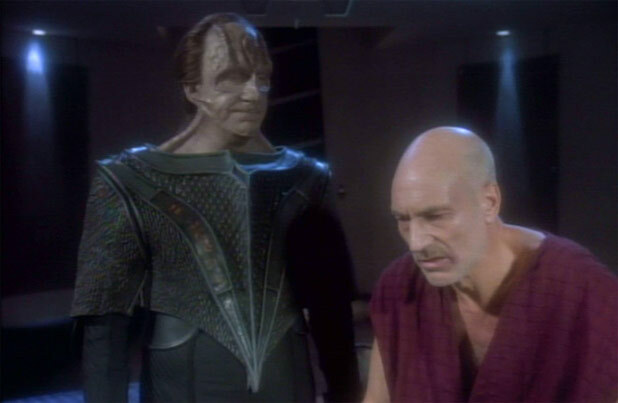 The following year he portrayed the Cardassian Gul Madred in the TNG sixth season two-part story Chain of Command. "There...are...four...lights!" Kind of an obvious one, but all the same one we should include. 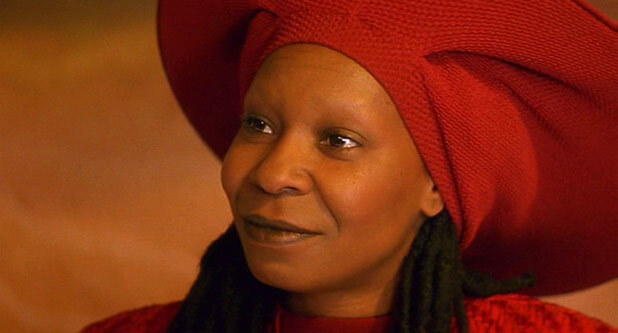 Whoopi Goldberg famously played Guinan in occasional episodes of TNG. Another Star Trek recurring guest star, and one who's often better remembered as Howling Mad Murdock on The A-Team. 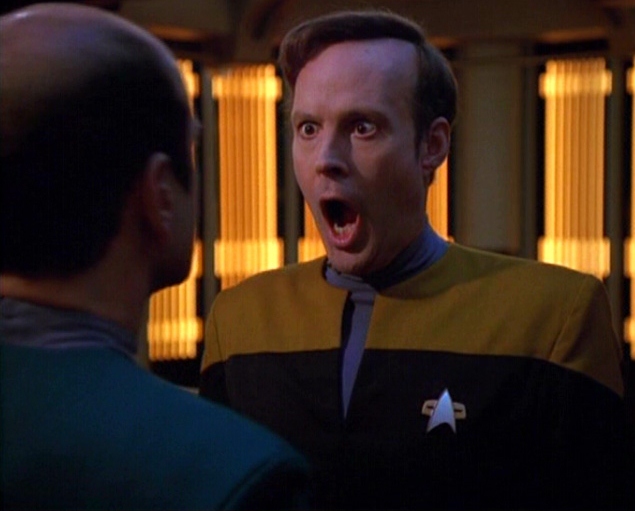 Schultz played Reginald Barclay in TNG, Voyager and First Contact. 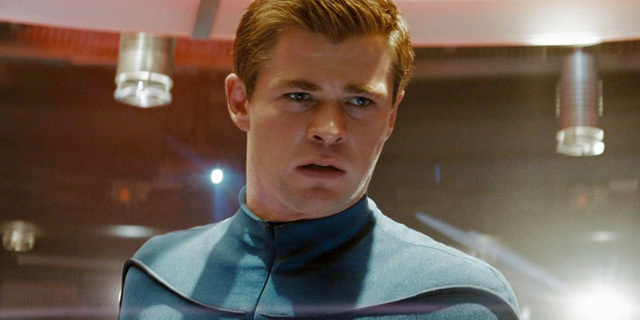 Before Thor, Chris Hemsworth portrayed George Kirk, the father of James T. Kirk, in J.J. Abrams' Star Trek in 2009. Recently you may have seen Brenda Strong in the 2013 relaunch of Dallas, before that she was heard but rarely seen as Mary Alice Young, the deceased narrator on Desperate Housewives. But way back in 1988 she played the role of Rashella in the Star Trek: The Next Generation first season episode When The Bough Breaks. Best known for St. Elswewhere, Ed Begley, Jr played Henry Starling in the two-part Voyager story Future's End. 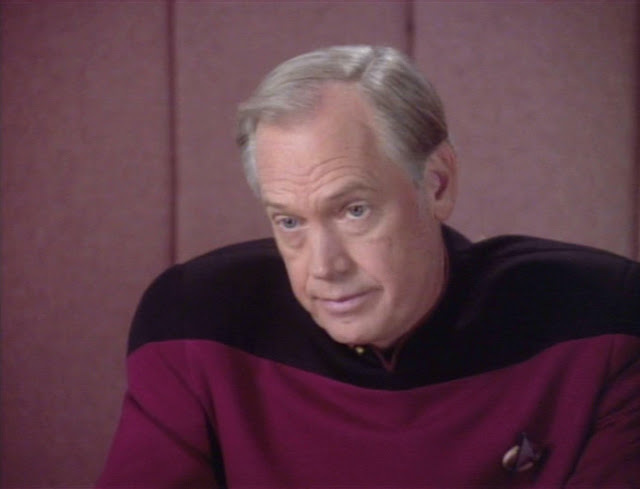 Ronny Cox played Captain Edward Jellico in the two-part The Next Generation sixth season story Chain of Command, Part I. More recently you'll find her in Californication, but back when Pamela Adlon was Pamela Segall she played Oji in The Next Generation episode Who Watches The Watchers. 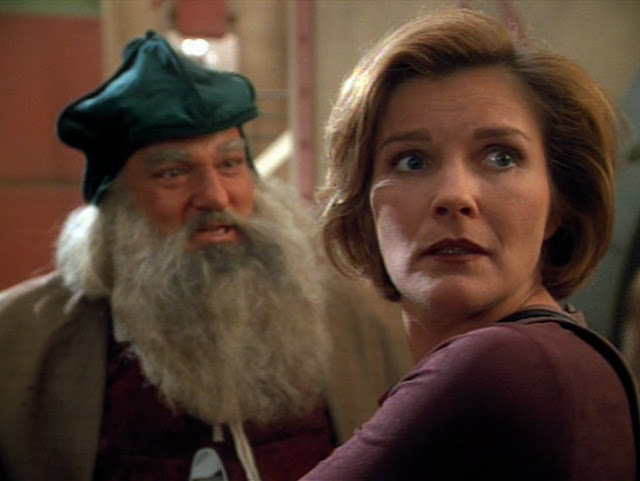 That would be a hologram of Leonardo da Vinci surprising Captain Janeway. And playing the legendary scientist and artist is the almost as legendary Welsh actor John Rhys-Davis, who appeared in two Voyager episodes, Concerning Flight, and Scorpion: Part 1. From The Shawshank Redemption, through 24 and Daredevil (to name just three), Bob Gunton has a mighty impressive resume, and of course he's appeared on Star Trek too. You would have seen him as Captain Benjamin Maxwell in The Next Generation fourth season episode The Wounded. That man on the left up there is none other than Det. Ken 'Hutch' Hutchinson, or David Soul if you'd rather. Way back in 1967, in only his third television role, he played Makora in the Original Series episode The Apple. Probably most famously known as Theodore 'T-Bag' Bagwell from Prison Break, a young Mr Knepper played Wyatt Miller in the 1987 Next Generation episode Haven. Before spending years on Desperate Housewives, Moses guest starred in flashback in the two-part pilot episode of Enterprise, Broken Bow. He played Henry Archer, the principal developer of the first warp five engine, and one of the designers of Enterprise NX-01. He was a good friend and colleague of Zephraim Cochrane, and most importantly, he was Jonathan Archer's father. Moses also has another Star Trek appearance to his credit, as he played Naroq in the 1999 Voyager episode Riddles. Another of the male stars of Desperate Housewives who also guest starred on two different iterations of Trek. Culp played Major Hayes, the leader of a special team of elite soldiers known as the Military Assault Command Operations team, in 5 episode of Enterprise; Countdown, Hatchery, Harbinger, The Shipment, and The Xindi. He also played Commander Martin Madden, Jean-Luc Picard's new first officer in Star Trek Nemesis, but his scenes were deleted from the final film. The WWE wrestler appeared on Enterprise playing an Orion Slave Trader in the episode Borderland. As we have just celebrated the 50th anniversary of Star Trek, what better time to add Sally Kellerman to this collection. Her many acting credentials include playing Maj. Margaret 'Hot Lips' O'Houlihan in the 1970 movie version of MASH. Prior to that she played Dr Elizabeth Denner in the second Star Trek pilot episode (and the third episode to be televised), Where No Man Has Gone Before, which was filmed in July 1965. Doctor Who fans will know her as Dr Grace Holloway from the 1996 TV Movie, but three years before that Daphne Ashbrook played Melora Pazlar on the season 2 Deep Space Nine episode Melora. Ron Howard's little brother Clint was only 7 years old when he appeared as Balok in The Original Series episode The Corbomite Maneuver. 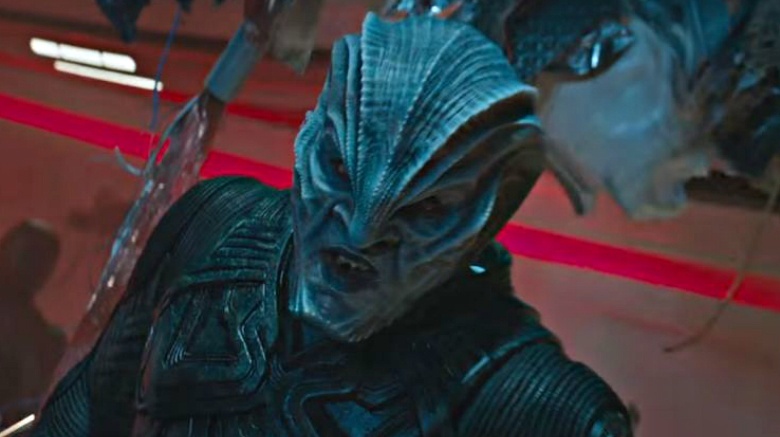 He made his acting debut three years prior to that and has since racked up over 230 IMDB credits, among them are two more guest spots on Star Trek. A significantly older Clint played Grady in part two of the Deep Space Nine episode Past Tense, and in 2002 he guest starred in Enterprise as Muk in the first season episode Acquisition. She's probably best known for playing Pam De Beaufort on 67 episodes of True Blood, but back in 2005 Kristin Bauer van Straten guest starred on the Enterprise episode Divergence as the female Klingon warrior Lt. Laneth. Almost unrecognisable, Idris Elba, the actor who seems to feature in every other movie released recently, portrayed Krall in Star Trek Beyond. Did you know all of them? And have we missed any? Thought so, not Davis. Shame! Kelly Rowland . I forget the episode but she plays a Female Klingon on a Bird of Prey. Mae Jemison, a real astronaut, appeared on TNG as transporter officer. She was inspired to become and astronaut by Lt Uhura (Nichelle Nichols). Ray Wise, from Robocop and Twin Peaks, played Liko, in the third season TNG episode "Who Watches the Watchers"
Everyone seems to have forgotten the famous lawyer Melvin Belli who played Gorgon in the classic Trek episode "And The Children Shall Lead". You missed Jonathan Goldsmith, "The Most interesting Man In The World" from the Dos Equis beer commercials, he was an Unnamed Red Shirt in the 1966 episode The Corbomite Maneuver (uncredited). Diana Muldaur, who originally played a role (Miranda? She was blind) in TOS then returned as Dr Pulaski is TNG. Majel Barrett originally guested on TOS (with the guy who played Lurch, I don't remember his name) before coming back as Nurse Chapel. Majel Barrett WAS playing Nurse Chapel in that episode with Ted Cassidy (Lurch) it wasn't a guest appearance, it was her first episode as Chapel. But I agree with you that she should be included because she was the voice of the computer, as well as Lwaxana Troi. She was also Number One in the Cage. Has everyone forgotten Virginia Madsen who played Kellin in the episode "Unforgettable" on Voyager? I thought it was an "unforgettable" performance. 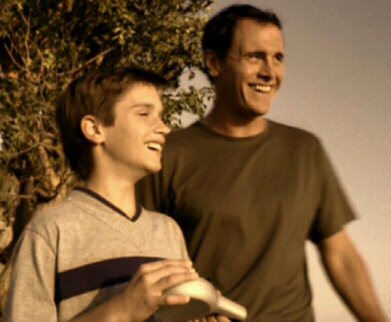 Robert Knepper (T-Bag from Prison Break) was in the Next Gen season 1 episode "Haven". Excellent. I've added him to the list above. Thanks. David Ogden Stiers, who played Maj. Charles Emerson Winchester on M*A*S*H, guest starred in TNG's episode "Half a Life" as Dr. Timicin. Major Charles Emerson Winchester the Third, sir. And RIP to all of them. Pianist, composer and radio host John Tesh appeared as a Klingon warrior in the TNG episode "The Icarus Factor." Ray Walston, already known for My Favorite Martian, Picket Fences and Fast Times at Ridgemont High (among others), had a recurring role as Starfleet Academy's groundskeeper Boothby in both TNG and Voyager. Singer Michelle Phillips of The Mamas and the Papas guest starred as Jenice Manheim in the TNG episode "We'll Always Have Paris." Gene Roddenberry, the father of the Star Trek franchise, had a brief voice-only appearance as the Enterprise chef on the TOS episode "Charlie X." Katherine Hicks who starred with Stephen Collins in Seventh Heaven was The Voyage Home! Frank Langella (arguably most noted for his Broadway career and as Richard Nixon in Frost/Nixon, among many credits) played Minister Jaro Essa in the first three episodes of Star Trek: Deep Space Nine's second season. Interestingly, he was uncredited for the role. 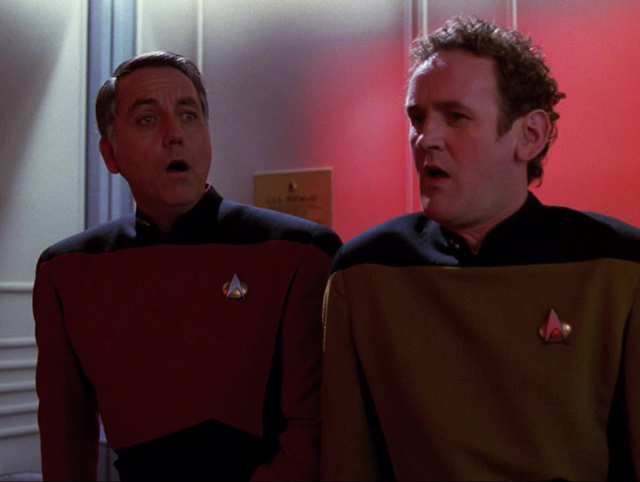 Mark Moses and Steven Culp from Desperate Housewives are both on Enterprise. Brilliant, thank you. I've added them both. Was Vanity in any of the shows? It wasn't that episode, but " Miri". Check MemoryAlpha, the Trek wiki. Teri Garr played Roberta Lincoln in an episode titled Assignment Earth in the original series. Paul Wight, aka "The Big Show" from pro wrestling guest-starred in the Enterprise episode "Borderland" as a very tall Orion slave-trader. Thanks for the suggestion, he's on the list now. Harve Bennett was the voice of a flight recorder in ST The Search of Spock, and Starfleet Chief of Staff Admiral Robert Bennett in ST The Final Frontier. I agree, Brad Dourif is outstanding and a great idea to have a betazoid who can't empathize! Ok here are three that i saw just in DS9 Frank Langella played in several episodes as Bjoran Minister Jaro, Brian Thompson played 2 characters in DS9 he was Inglatu in Rules of Aquisition and more notably he was the Jem Hadar Toman'torax in To the Death, and finally of course let us not forget Gabrielle Union as the Klingon N'Garen in Son's and Daughters. I must admit I'm shocked no one has mentioned Academy Award winning actress Louise Fletcher, nurse Ratched herself from One Flew Over The Cookoo's Nest in countless episodes of DS9 as Vedek/Kai Winn. She's actually who I was looking for when I came here. I too am surprised an Oscar winner wasn't mentioned. Two "Princess Bride" stars in DS9. Inconceivable that you missed them. 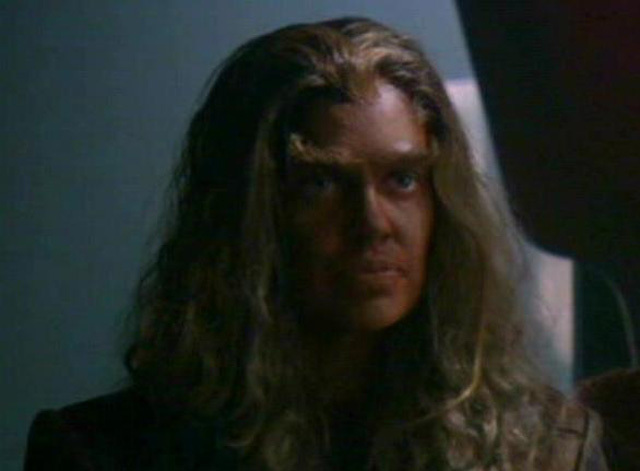 Gabriel Union played a Klingon on DS9. Kate Mulgrew as Captain Kathryn Janeway has had a career before and after ST:VOY. 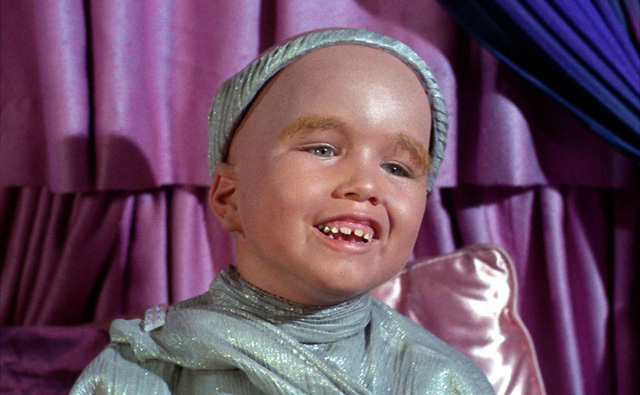 Clint Howard plaed Balok in the original series The Corbomite Maneuver. He's Ron Howard's brother and in everything. I think he was 8 years old at the time. Miguel Ferrer 1984 search for spock. 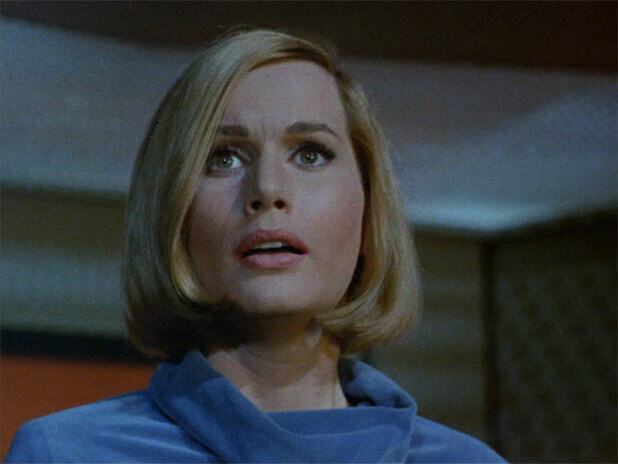 Sally Kellerman from the M*A*S*H movie was on Star Trek "Where No Man Has Gone Before" (1966). *Tony Todd was Worf's brother Kurn on TNG, adult Jake Sisko on DS9, and an Alpha Hirogen on Enterprise. I agree. I know Guinan(Whoopi) was credited as a guest but she was a reccuring character. McDowell, Hardy & Elba were main movie villains. Deitrich bader was in season 2 episode 20 of TNG while Worf played "captain"(I don't know what his characters name was) n Glenn Morshower was in the next episode as Ensign Burke. Also, John Anderson starred in The Survivors on TNG. Very famous actor that was in basically everything. One thing I remember him for was as the pilot of flight Global 33 on a classic Twilight Zone episode. But also Quantum Leap, MacGyver, Dallas, Mash, THe Jeffersons. He is a long acting career that goes back way before my time. George Richard Beymer, Jr. (West Side Story, Twin Peaks, etc.) played Li Nalas on DS9. Ron Howard's little brother played the little small guy with a big space ship. He and Kirk drank Tranya together. Glen Close !!! No one has mentioned her that I can see. She was in TNG. Daphne Ashbrook on DS9 episode "Melora",from the OC, Dr Who, Hollywood Heights. Olivia d'Abo, in "True Q"
Catherine Hicks in "The voyage Home." Oscar-winner F. Murray Abraham (Amadeus) was Ahdar Ru'afo, the primary villain in Insurrection. Yvonne Craig (Batgirl) was an Orion slave girl/mental patient Marta in the TOS episode Whom Gods Destroy. Lee Meriwether (Catwoman) was in the TOS episode That Which Survives. tough guy character actor Charles Napier was a space hippy in The Way To Eden (Original Series), NFL player/blaxploitation movie tough buy Fred Williamson was in The Cloud Minders (Original Series), Marriette Hartley was in All Our Yesterdays (Original Series), movie actor Robert Walker was Charlie X in the TOS episode of the same name, Sid Haig (of so many fine horror films) was in Return of the Archons (Original Series). There are others, too! Jeff Kober was Traeg on Enterprise "Shadows of P'Jem", and Iko on Voyager "Repentance"
Oscar winner Joel Grey was a guest on a Voyager episode. The woman host from Top Chef. From Star Trek - Memory Alpha: "Padma Lakshmi (born 1 September 1970; age 46) is the actress who portrayed Kaitaama in the Star Trek: Enterprise episode "Precious Cargo"." Kate Vernon (Ellen Tigh from Battlestar Galactica) was in the Voyager episode "In the Flesh"! Also, Terri Garr from the TOS episode "Assignment Earth"!! James Sloyan was TNG Setol/Admiral Alidar Jarok "The Defector", K'Mtar "Firstborn", VOY Ma'bor Jetrel "Jetrel" and DS9 Dr. Mora Pol "The Alternate" and "The Begotten". Jonathan Del Arco was TNG Third of Five/Hugh "I Borg" and "Descent: Part 2" and VOY Fantome "The Void". Tony Todd was TNG Kurn "Sins of the Father" "Redemption" and "Redemption II", DS9 Adult Jake Sisko "The Visitor" and Kurn "Sons of Mogh" and VOY Alpha Hirogen "Prey". Donny Most, Ralph from Happy Days, played a bit part in the Voyager two-part episode "Workforce"!! Larry Hankin, Mr Heckles from Friends, was a hologram in Voyager's "The Cloud" episode. Fobert Foxworth, (Chase Gioberti from Falcon Crest 1981-1987). Admiral Leyton in DS9 episodes "Homefront" and "Paradise Lost". Vulcan V'Las in Enterprise "The Forge", "Awakening", and "Kir'Shara". Good site! Wasn't there an N A star on TNG??? 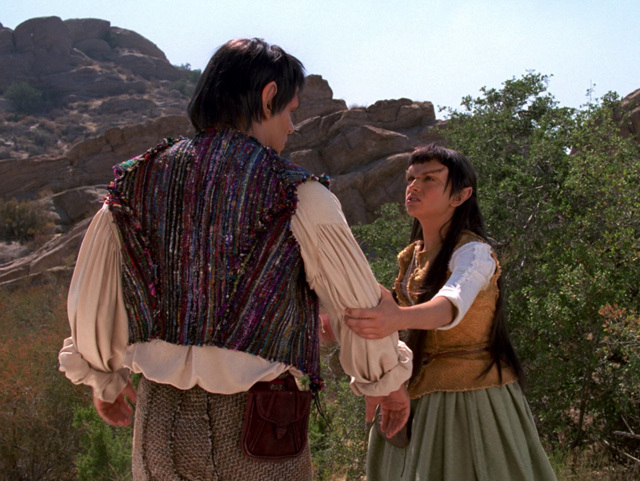 Robert Knepper also appear on Voyager as Gaul, the Vaadwaur leader in the episode Dragon's Teeth if I'm not mistaken. Michael Deacon, who played Grima Wormtongue in The Lord ofRings, was Crewman Suder, the murderer, on Voyager. Diedrich Bader in season 2 "Emissary" of TNG. Anne Elizabeth Ramsay in 2 episodes of TNG. Mitchell Ryan played Kyle Riker in the TNG episode "The Icarus Factor"
Probably because he wasn't a guest star, but was the main cast member of that series. John Glover as Verad Dax in Deep Space Nine - Invasive Procedures. He was Lionel Luthor in Smallville. The other actor in your photo for entry #58 is "Ray Wise" (Known from shows like Reaper,The Young & The Restless, Agent Carter, How I Met Your Mother, and many other shows). In that Episode (Who Watches the Watchers) he played "Liko". He also appeared in an episode of Star Trek Voyager (Hope and Fear) and something called: Star Trek Captain Pike. Astronauts Mike Fincke and Terry Virts were guest stars on the final episode of Star Trek: Enterprise. They are well known to NASA fans. John de Lancie as "Q" in both TNG and Voyager. His son played his son on one episode of Voyager. If we are including the reboot movies, don't forget Jennifer Morrison, Dr. Cameron on "House MD" and Emma Swan on "Once Upon a Time" among others, played Winona Kirk, James Kirk's mother in the 2009 movie. Also, Benedict Cumberbatch of "Sherlock" fame played Khan in Into Darkness. Speaking of Khan, how can Ricardo Montalban not be on this list???? Let's not forget that before starring in "Wrath of Khan," he guest starred as Khan in the Original Series, so in my book he has to be considered a guest star. I agree, why wasn't Ricardo Montalban included? And of course Jean Simmons in the TNG episode "The Drumhead"
Brock Peters as Captain Sisko's father in DS9. Episode "Far Beyond the Stars"
Brock Peters played Joseph Sisko in half a dozen episodes of DS9. He also played Adm. Cartwright in Star Trek IV: The Voyage Home and Star Trek VI: The Undiscovered Country. James Worthy (Lakers) was a Klingon shuttle pilot in a TNG episode. Peter Graves was in the David Soul episode. And the original, and best Catwoman, Julie Newmar was also in TOS. No, Peter Graves was not. You're thinking of Keith Andes, who did have something of a resemblance to Peter and his brother James Arness, come to think of it. Didn't Joan Fontaine appear on Next Generation? Sabrina LeBeauf, Sondra Huxtable, from the Cosby Show. In the 1989 TNG episode "The Emissary", toward the end when WORF is not at his usual tactical post, Diedrich Bader (of The Drew Carey Show) took his place and actually had one line. Yvonne Craig-she was the green girl who tried to "entice" Kirk...I can't recall the episode. She is probably best known as TV's Batgirl with Adam West and Burt Ward. Already mentioned above, but I'll second it: Julie Newmar played the character Eleen in S2E11 of TOS "Friday's Child". She was the original Cat Woman, and she has a cameo/theme in the movie To Wong Foo Thanks for Everything Julie Newmar. What about Michael Ansara? He was in Voyager as Kang the Klingon speaking to Captain Sullu when Tuvoc was reliving his experience to Captain Janeway. Wasn't that Diana Rigg in TNG as a Romulan Commander in the episode where counselor Troi went undercover on a Romulan ship? Sure sounded like her. That was Carolyn Seymour, one of a long list of recycled Trek actors. She played two different Romulan commanders, as well as Space Minister Mirasta Yale, on three episodes of TNG, as well as the housekeeper in Capt. Janeway's holonovel on several episodes of Voyager. William Daniels (Dr. Mark Craig) was the voice of the hospital's allocation computer in the Voyager episode "Critical Care." Norman Lloyd (Dr. Daniel Auschlander) played Professor Galen, Capt. Picard's mentor, in the TNG episode "The Chase." Ellen Bry (Nurse Shirley Daniels) played Dr. Farralon, the inventor of the exocomps that Data wants to save, in the TNG episode "The Quality of Life." 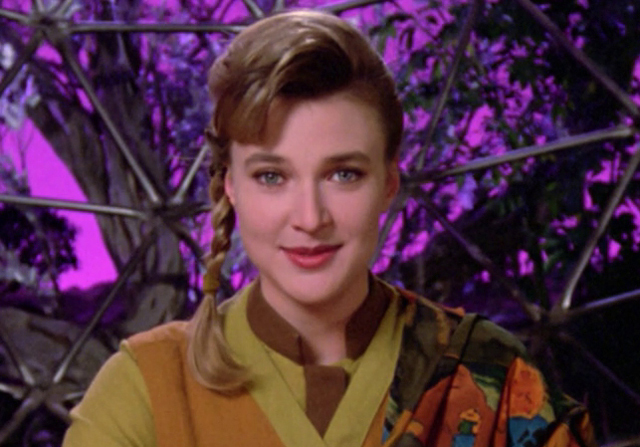 Jennifer Savidge (Nurse Lucy Papandrao) played Fala in the DS9 episode "The Darkness and the Light." Kavi Raz (Dr. Vijay Kochar) played engineer Singh in the TNG episode "Lonely Among Us." David Birney (Dr. Ben Samuels) played Letant in the DS9 episode "Tears of the Prophets." France Nuyen (Dr. Paulette Kiem) guest starred as Elaan of Troyius in the TOS episode of the same name. Bruce Greenwood (Dr. Seth Griffin) played Christopher Pike in the rebot movies Star Trek and Star Trek: Into Darkness. Alfre Woodard (Dr. Roxanne Turner) guest starred as Lily in Star Trek: First Contact. 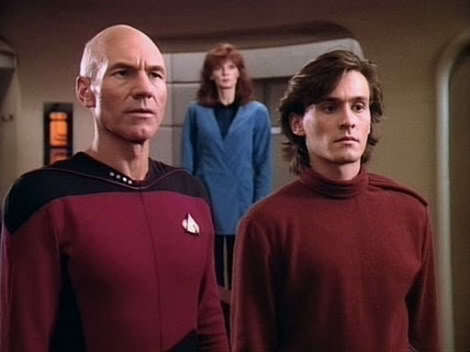 Chad Allen, who played Dr. Westphall's autistic son Tommy, guest starred as Jono, the orphaned human boy living as a Talarian, in the TNG episode "Suddenly Human." Karen Landry, who had a recurring role as Dr. Peter White's wife Myra, played the Vorgon Ajur on the TNG episode "Captain's Holiday." Dr. Mae Jemison, a NASA astronaut who orbited Earth aboard the space shuttle Endeavour, played the transporter operator who beamed up the "other" Will Riker in the TNG episode "Second Chances." Michael Welch, most recently known for playing Mike in the Twilight Saga movies and Luke in Joan of Arcadia, played Artim, the towheaded kid who played with Data in the straw, in Star Trek: Insurrection. William O. "Billy" Campbell is known for many parts he's played over the years, in The 4400, Tales of the City, The Rocketeer, Melrose Place, Once and Again and other shows. 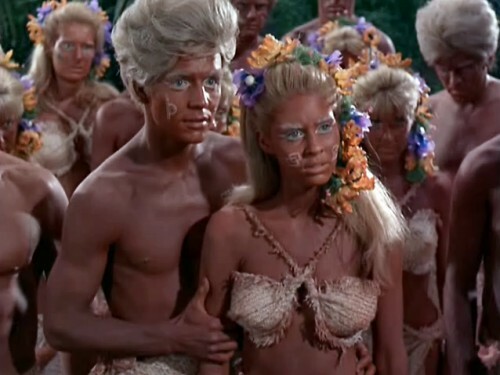 He guest starred as Thadium Okona in the TNG episode "The Outrageous Okona." It was a consolation prize of sorts for not getting the role of William Riker when TNG was cast (Jonathan Frakes beat him out of it). Legendary French Canadian actress Geneviève Bujold, best known for playing Anne Boleyn in Anne of the Thousand Days, played Capt. Nicole Janeway on the Voyager premiere episode "Caretaker" -- until producers hurriedly recast the part with Kate Mulgrew and renamed the character Kathryn. And although all of Bujold's scenes had to be reshot with Mulgrew, a close-up shot of Bujold's hand on a console made it to the final cut. Madge Sinclair was a recurring actress on TV through the 1970s-90s. But she is best known for her role as Nurse Shoop in Trapper John, MD, as well as for playing half of a royal African couple (opposite James Earl Jones) in two movies: The Lion King and Coming To America. She had an uncredited role in Star Trek IV: The Voyage Home as the captain of the USS Saratoga, the first starship to encounter, and be disabled by, the probe heading toward Earth. Later, she would appear as Capt. LaForge, the captain of the USS Hera and Geordi's mother, in the TNG episode "Interface." Legendary entertainer Ben Vereen also appeared in the TNG episode "Interface" as Geordi's father. Mitchell Ryan, best known for playing Greg's father on the sitcom Dharma and Greg, played Kyle Riker, Cmdr. Riker's father, on the TNG episode "The Icarus Factor." Suzie Plakson, most recently known for How I Met Your Mother but also for Mad About You and Love and War, is one of an illustrious line of recycled Trek actors. She's best known as the Klingon K'Ehleyr, Worf's mate and Alexander's mother, in the TNG episodes "Emmisary" and "Reunion." But she also played Dr. Selar, the Vulcan doctor who beams down to treat Ira Graves, in the TNG episode "The Schizoid Man." She was the female Q (Q's ex-wife) in the Voyager episode "The Q and the Grey." And she also played the Andorian Tarah, Shran's adjutant who tries to sabotage his peace initiative, in the Enterprise episode "Cease Fire." Two actors have joined the ranks of Trek recycled actors -- and have done it together, in the same two Trek productions. Merritt Butrick is best known for his breakthrough role as Johnny Slash in the sitcom Square Pegs. But to Trek fans he will always be Capt. Kirk's son David, a role he played in Star Trek II: The Wrath of Khan and Star Trek III: The Search for Spock. 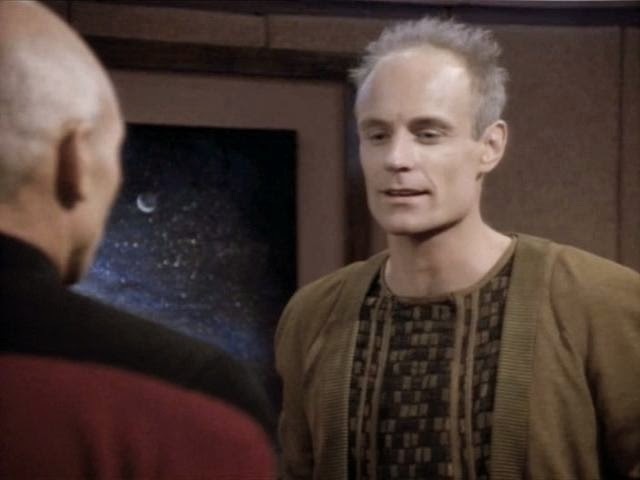 Butrick also guest starred as T'Jon, one of two Ornarans who are trying to get a valuable shipment of the drug felicium back to their home planet, in the TNG episode "Symbiosis." Judson Scott has appeared in several TV shows, most notably The Colbys. 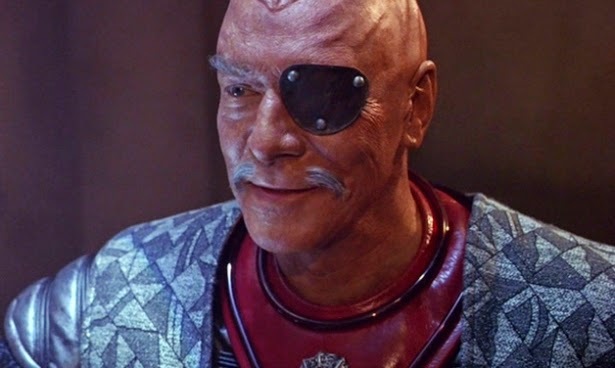 He had an uncredited role as Joachim, Khan's adjutant whose death toward the end of the film Khan vows to avenge, in Star Trek II: The Wrath of Khan. He also appeared as Sobi, one of the Brekkans who don't want to part with their felicium, in the TNG episode "Symbiosis." Judson Scott was further recycled as Rekar, the Romulan commander who tried to hijack the USS Prometheus, in the Voyager episode "Message in a Bottle." Phil Morris has had a long career on TV, but he is perhaps best known for his roles as Grant Collier on the 1988 remake of Mission Impossible (his father, Greg Morris, played Barney Collier in the original) or the chief purser on the 1998 remake Love Boat: The Next Wave. He has also joined the illustrious ranks of recycled Trek actors. Way at the beginning of his career, he had an uncredited role as the boy wearing the Army helmet in the TOS episode "Miri." Later, he played the cadet on board the Enterprise who mused about returning home to a hero's welcome on Star Trek III: The Search for Spock. He played a Klingon commander in the DS9 episode "Looking for par'Mach in All the Wrong Places," as well as a Jem'Hadar in the DS9 episode "Rocks and Shoals." Finally, he played Lt. John Kelly, the commander of the doomed mission to Mars that Seven of Nine gets to know three centuries later through his logs, in the Voyager episode "One Small Step." James B Sikking, whose career of almost 60 years includes co-starring roles in Hill Street Blues and Doogie Howser, MD, appeared in Star Trek III: The Search for Spock as Capt. Styles, the captain of the USS Excelsior, which Scotty sabotages so that the Enterprise can make its escape. Legendary actor Miguel Ferrer played Capt. 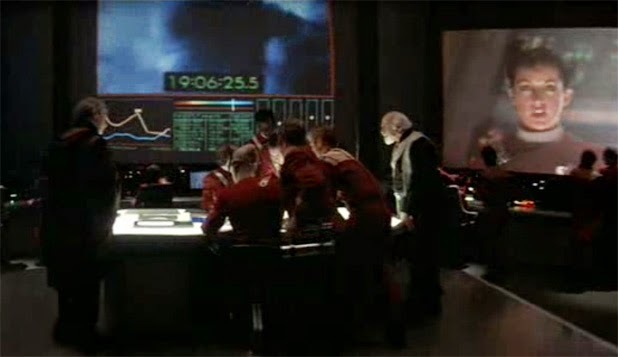 Styles' executive officer on board the USS Excelsior in Star Trek III: The Search for Spock. Kevin Tighe, best known as Paramedic Roy DeSoto in Emergency!, played Henry Janeway, Capt. Janeway's ancestor, in the Voyager episode "11:59." Scott Thompson of The Kids in the Hall and The Larry Sanders Show guest starred as the over-indulging novitiate Tomin who gives Neelix so much trouble in the Voyager episode "Someone To Watch Over Me." Paul Sorvino as Worf's adoptive brother. I am surprised no one mentioned Mariette Hartley in the 69 episode "All Our Yesterdays"
Has every actor been listed in the comments yet? Actor terry oquinn. John locke from lost played rikers first captain who later becomes admiral pressmen. He appears in the tng episode "the pegassus"
Daniel Davis, the super funny butler in the sitcom The Nanny, was Professor Moriarty in episode "Elementary, Dear Data" in season 2. Ron Glass is in the Voyager episode Nightingale. Spelling correction: Robert Lansing. We know the character as "Gary Seven" but I wonder if you might have something with the numeral 7 representing him as a clone or something, perhaps a member of one of the holdover numbered android series from the planet Mudd. Diedrich Bader (born 24 December 1966; age 52) played the part of a tactical officer in the Star Trek: The Next Generation second season episode "The Emissary" in 1989. ... Bader is perhaps best known for his role on The Drew Carey Show as Drew's dim-witted friend Oswald. Malachi Throne, Ricardo Montalban, Morgan Woodward, William Windom, Roger C. Carmel, Nehemiah Persoff, John Anderson.